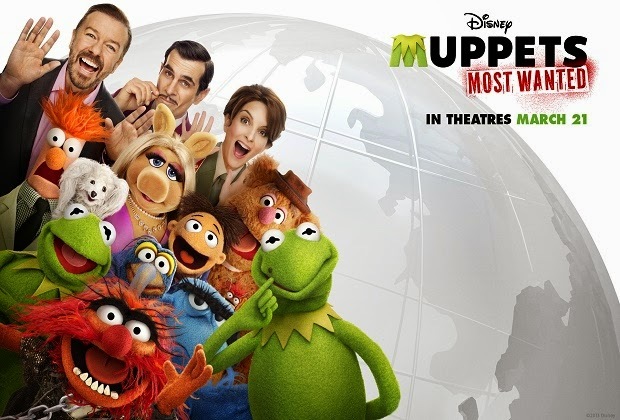 The Muppets are back again with Muppets Most Wanted. Last time around we saw the gang get back together with a film full of everything that made the Muppets great, musical numbers, audacious celebrity cameos and top notch humour that hits every demographic. The Muppets came back in a big way, and naturally we asked the inevitable question, will there be a sequel? Chances certainly looked high. It was crazy successful in the box office, and it won Oscar for "Best Original Song." After all of that, my brain could only think, "God, I hope it's decent." Muppets Most Wanted picks up directly after the previous film and brings up an excellent issue, what next? The gang is back together and they are once again successful (kind of). What's the next step? Enter Dominic Badguy (Ricky Gervais), a promoter who wishes to "help" the Muppets get worldwide recognition with a world tour. Their first stop is the comedy central of the world, Berlin. There, Kermit is mistaken as the number one criminal in the world, Constantine. The real Constantine pulls the ol' switcheroo, takes his place with the Muppets, and poor Kermit gets placed in a Gulag in Siberia. The jail is run by Nadya (Tina Fey), a woman with incredible ambition, drive, and a little crush on Kermit. Danny Trejo is annoyed at Kermit. Muppets Most Wanted is an unusual film in that I felt I have seen this plot before. All the elements of previous Muppet films are there. Kermit is trying to keep the madness created by his friends focussed while he fends off the advances of Miss Piggy (didn't they marry two decades ago?). The Muppets themselves don't listen to Kermit until they realise they may not have him around any more. Also Walter (one of the main cast from the previous film) is relegated to supporting cast member and is barely given any material to work with -- an unfortunate outcome considering they made such a big deal about adding a new Muppet. Thankfully, that is where my problems with Muppets Most Wanted end. If you can get past these little issues you will be in for a real treat. Tina Fey was absolutely hilarious, and her supporting cast was top notch. Ricky Gervais continues to impress as he brings a needed edge to this film. Ty Burrell partnered with Sam Eagle was non-stop laughs. Muppets Most Wanted feels like an homage back to the days when song and dance was the norm in films and I loved it. It's not perfect but it brought me back to those evenings I'd stay up and watch The Muppet Show on television where I would just lose myself in their ridiculousness.